Snowdon is the ancient poetic name for Stirling. 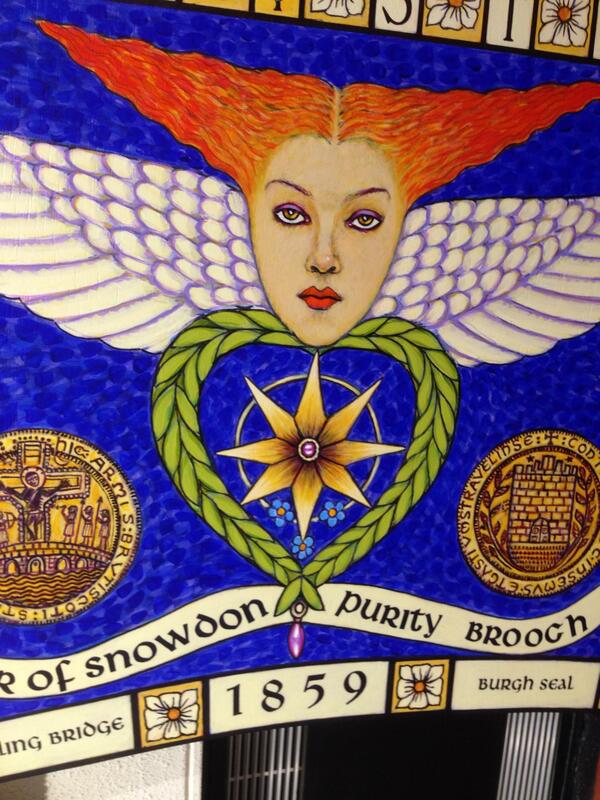 In 1859, the Star of Snowdon Purity Brooch was a piece of Stirling-inspired jewellery made for the women of the Drummond family to celebrate the inauguration of the Virgin Martyrs Monument in the new Valley Cemetery. The cemetery was created with money from the Drummonds who were successful seed merchants and agricultural machinery suppliers. From the sculptor Handyside Ritchie, Drummond commissioned marble sculptures of two women covenanters, Margaret Wilson and Margaret McLaughlan who were sentenced to death by drowning in the tidal waters of the Solway for their faith on 11 May 1685. A third girl, Margaret Wilson’s younger sister Agnes was spared because of her age. The forget-me-not flowers of the brooch commemorate the three women. The laurel wreath is in recognition of the martyrdom while the pearls are symbolic of the Christian name Margaret. The Stirling Smith is fortunate to have three such brooches in the collection, and now the artist June Carey has painted the brooch as the central image of her Guardian Angels mural over the front door of the museum. The mural both celebrates and seeks to protect the Smith collections. It was made possible through the contributions of former Smith Education Officer Patricia Cook. I have one of these brooches, presumably brought to Australia by my maternal grandparents, John and Catherine Ramsay. They emigrated to Sydney in 1913, from Glasgow. I have not followed the family tree back far enough to discover any Drummonds, but there are certainly plenty of Margarets in the family. I wrote to the Stirling Smith in 2007 and received a most informative reply from Dr Elspeth King. Unfortunately I’ve lost the images she sent me of the monument, and of one of the brooches that is held at the museum. If anyone can guide me to further sources of information, I’d be most grateful.